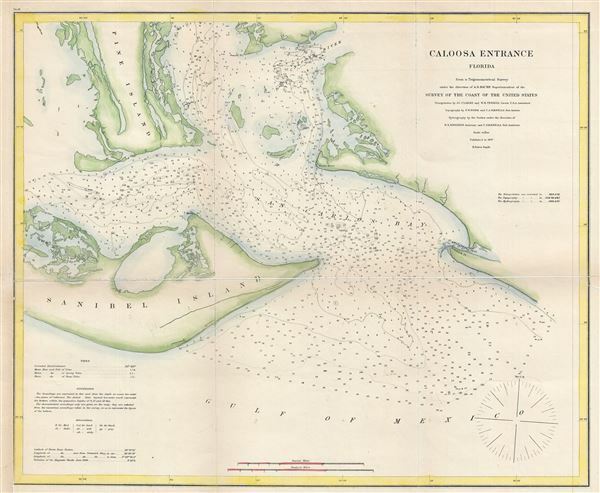 This is a beautiful example of the 1867 U.S. Coast Survey nautical chart or maritime map of the entrance to the Caloosa (Caloosahatchee) River in Florida. Centered on the San Carlos Bay, this map covers from the eastern portion of Sanibel Island to the entrance of the Caloosa River. The southern portion of Pine Island is also included. Bowditch Point, Matanzas Pass, Punta Rasa, Sword Point, Fisherman's Key and Middle Point are also identified. The chart includes countless depth soundings in feet as well as detailed notes on soundings, tides and a wealth of other practical information for the mariner. The triangulation for this map, executed in 1858 and 1861 was the work of J .C. Clarke and W. R. Terrill. The topography by completed by F. W. Dorr and C. J. Iardella 1858, 1866 and 1867. The hydrography was accomplished by parties under the direction of W. S. Edwards and C. J. Iardella 1866 and 1867. The whole was compiled under the supervision of A. D. Bache, one of the most influential American cartographers of the 19th century. This chart represents plate no. 18 in B. Peirce's 1867 Report of the Superintendent of the United States Coast Survey. Pierce, B., Report of the Superintendent of the United States Coast Survey, (Washington) 1867. Very good. Minor wear and toning along original fold lines. Repair over split visible from front. Professionally flattened and backed with archival paper. Margin extended in lower left quadrant.